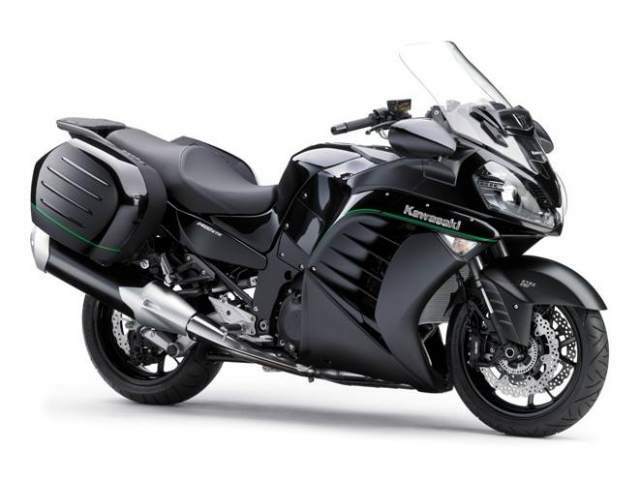 WHILE we’re swamped with acronyms and new technology from every angle in the flurry of new models being revealed this week in Milan, it’s worth mentioning that Kawasaki’s GTR is getting a few updates to keep it on the top of its game. While it’s easy to forget the GTR amid the recent technological revolutions, it was actually the bike that first introduced many of the technologies that other firms are only now catching up with. Back at its launch in 2007 it was already rocking tyre pressure sensors, keyless ignition and variable valve timing; stuff that plenty of other companies are still touting as ‘new’ eight years down the line. And it’s had traction control and clever combined ABS since its 2010 facelift. For 2015, the changes are hard to spot but big enough for the firm to consider it an upgraded model. Visually, there’s a new windscreen with a ‘directional’ vent that has two open positions to cut low-pressure areas behind the screen and improve airflow over the rider’s helmet. More subtle is the reshaped seat, designed to make it easier for the rider to reach the ground and more comfortable for the pillion. Otherwise the bike is pretty much unchanged, although with its 1352cc, ZZR1400-derived engine, radial brake calipers and aluminium monocoque frame it’s still not missing out to its rivals when it comes to performance or handling.